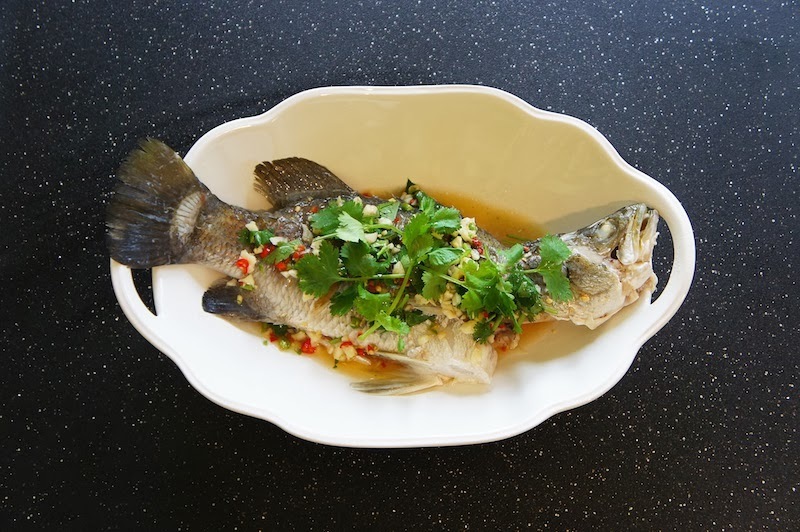 Barramundi is a readily available fish, and it is perfect for steaming whole. Try it with this fast, Thai styled recipe. Just steam the fish and whip up a sweet, spicy and sour sauce while it's cooking. Once the fish is cooked, spoon or pour the sauce over it. Topped with some coriander and served with plenty of steamed rice. Place the fish on a heatproof plate. Scattered some lemongrass and lime leaves all over and inside the cavity of the fish. Steam the fish on high heat for about 10 minutes, or until the fish is fully cook. In a bowl, combine the garlic, chilies, lime juice, fish sauce, sugar, and coriander. When the fish is ready, spoon the sauce over the fish. Serve immediately with some steamed rice. A very healthy way to cook fish. Looks good.